Vegetarians on the Via Francigena rejoice, with such a selection of meat-free dishes en route, the only problem you’ll face is knowing which one to choose! Here are some of my favourite Tuscan staples senza carne, in light of my recent trip walking the Via Francigena in Tuscany. Any sign of tartufo, the famous Tuscan truffle on a menu should be seen as an opportunity to sample this local delicacy at its finest. 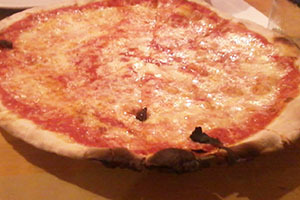 Truffle dishes can come in various forms, ranging from Tagliatelle and Ravioli to pizza topping and oil. There are a number of different varieties of truffle, San Miniato is the undisputed capital of the famous white truffle Tuer Magnatum Pico which comes into season in the Autumn months. Truffle hunting is a long standing tradition in the Tuscan countryside. Traditionally pigs were used to sniff out the precious fungus but nowadays its done by specially trained dogs. Was there ever a food so effortlessly satisfying as the perfect Italian bruscetta? 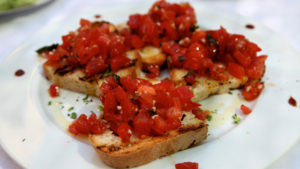 The pleasing combination of freshly diced tomato on crunchy bread, topped with a little olive oil is the quintessential example of the beauty in simplicity. Bruscetta when done like this never fails to deliver. This thick soup made with bread and vegetables is something akin to a hot water bottle after a long day’s walking. Ribollita is the epitome of peasant food, comforting and wholesome made using with the cheapest and most accessible ingredients that people could get their hands on, which in Italy is quite a bountiful amount of fresh fruit and veg. Peasants and pilgrims alike, can eat like kings on the Via Francigena. Vegan’s walking the Via Francigena can also take comfort as this dish generally doesn’t contain any eggs or dairy, although if your diet is particularly strict I recommend asking! Ravioli, Tagliatelle, Spaghetti, Fusillii, Lasagne, Farfelle, Linguine, Penne … are you hungry yet? Whether it’s bought from a street vendor and washed down with beer sitting in a medieval plaza or eaten sitting down at a nice r estaurant with a glass of Chianti. Pizza done right is the perfect food. And Italians always get it right. Italians often like to keep their pizza toppings simple, sometimes even omitting the cheese which is good news for anyone avoiding dairy. Most menus feature the pizza marinara, a pizza base topped with just some tomato sauce. 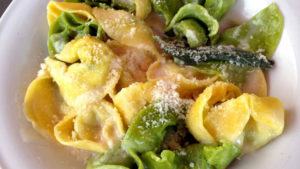 Do you have any favourite dishes for vegetarians on the Via Francigena? Please let us know in the comments section! For more information on walking the Via Francigena contact our travel specialists.